Preheat oven to 180°C/350°F. In a medium-sized saucepan, melt butter over medium heat for approx. 1 – 2 min. Remove from heat. Add brown sugar and eggs to saucepan and stir until well combined. Next, add the cocoa, baking powder, flour, and salt and stir until well combined. Add chocolate chips to pan and stir to evenly combine. Form one tbsp dough into golf ball-sized shapes and then flatten into cookies. 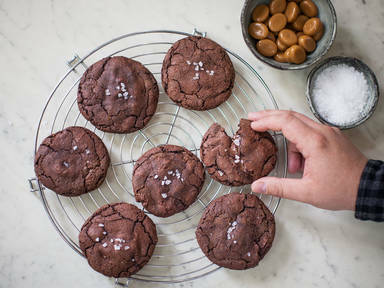 Place some hazelnut spread and a caramel candy into each cookie and seal edges. Place cookies on a lined baking sheet, sprinkle with fleur de sel, and bake in preheated oven at 180°C/350°F for approx. 8 – 12 min. After taking cookies out of the oven, set aside to cool down for approx. 10 min. Enjoy!